Philip Johnson is one of the most prolific and ingenious architects of the modern era. Johnson attended Harvard University in 1923 to study Greek. Upon his graduation in 1927, Johnson toured Europe and explored emerging architectural movements such as the Bauhaus school in Germany. 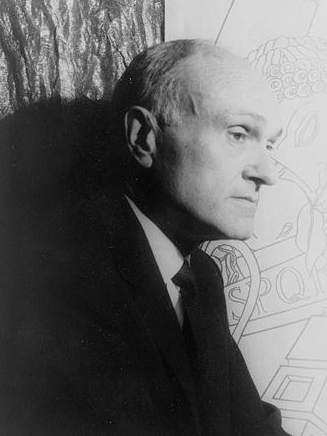 In 1930, Johnson became the director of the Museum of Modern Art, New York and in 1932 he collaborated with the architectural historian Henry-Russell Hitchcock for an exhibition on International Style. In 1942, Johnson returned the Harvard Graduate School of Architecture, where his thesis project and home – the Glass House, New Canaan, Connecticut, 1949 – established Johnson as leader of the modernist style. A clear homage to Ludwig Mies van der Rohe and the influence of Bauhaus, the Glass House makes use of industrial materials with glass walls and steel beams. In the 1950s, Johnson had the chance to work with his idol, as he joined Mies van der Rohe in designing the Seagram Building, planning its interiors and designing the iconic Four Seasons Restaurant. During the 1960s, Johnson moved away from Modernism and began to create designs in styles ranging from Romanesque to Neo-Classical, as evidenced by his orthodox Amon Center Museum at Dallas Fort Worth. Later, Johnson moved into his Post-Modern period, creating buildings like the Williams Tower in Houston and the 550 Madison Avenue Building in New York. Johnson died in 2005 leaving behind a legacy of notable structures including the Lipstick Building in New York, the David Koch Theater in New York, and the Booth House in New Bedford, among many others.